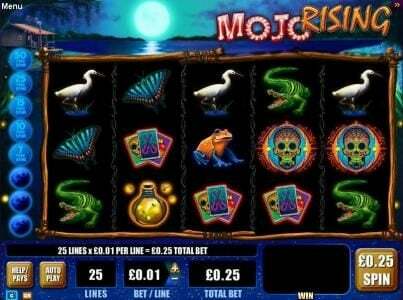 Mojo Rising online slot machine pictures and slot feature list from WMS, play Mojo Rising Slots for free. 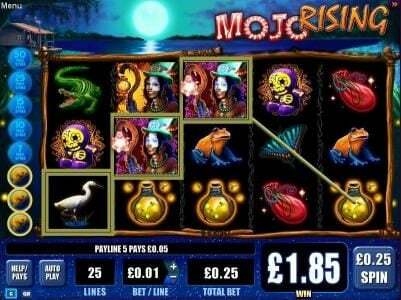 Mojo Rising Slots has not been reviewed yet, be the first to rate this slot. 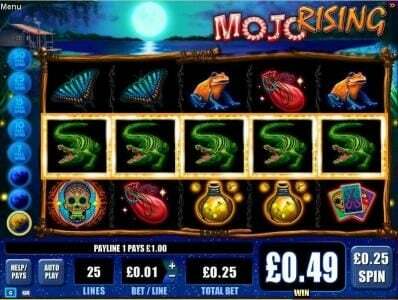 The Mojo Rising slot is a game provided by software developer WMS. This particular slot machine offers a large variety of ways to win and is one of the most popular in local casinos across the country. You now can play this slot machine game online if you’re from the United Kingdom and is already becoming a hit with folks from that region. Within this article I will be going over the symbols, features, and bonus information this particular game offers. 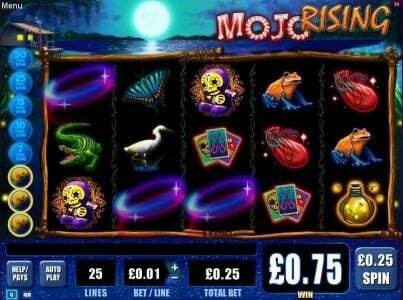 Mojo Rising is a 5 reel slot machine that gives you the opportunity to play 25 pay lines. The theme has a witch base theme and is highly unique for the concept of the game itself. The symbols you may receive while playing include voodoo dolls, skulls, fireflies, gators, and much more. You can also receive wild symbols while playing but they will appear on all reels except the 1st reel. This clearly gives you an advantage while playing as the wild symbol will convert to any other symbol to create winning combinations. Another really good feature is the cascading reels option it is installed with. This is how the bonus feature is actually awarded and basically will drop and add new symbols after each winning pay line. When playing Mojo Rising this will continue to happen until no other winning pay lines occur. Once you receive 4 winning spins in a row you will activate the free spins feature. 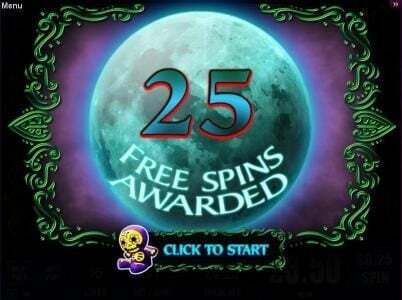 The lowest amount of free spins you can win is 7 but you can win up to 50 free spins at any time. Keep in mind the free spins feature can reactivate at any time and is not uncommon to do so. A majority of your larger wins will actually come from the free spins bonus round and the payouts can be quite impressive. I always recommend to play max bet on this slot machine as the win variance is low and it’s going to be hard to make a lot of money betting minimum or lower bets. Although this slot machine does not offer any other free spin features or bonus rounds the one feature it does offer is quite enough. You should be able to hit the free spin feature numerous times even if you’re just playing for a short period of time. Although the payouts tend to be less on this wms slot game how can one not give it a 10 out of 10 rating? The Bonus round as I mentioned above is easy to obtain and payouts are pretty decent compared to how many times you will enter it. This is a good slot machine game to play if you’re new to Slots locally or online. This particular slot game is less than 2 years old and is still in popular demand all over the world so clearly other Casino players must agree with the evaluation. You can play this Slot game online at Jackpot Party and can use the banner below to get started.